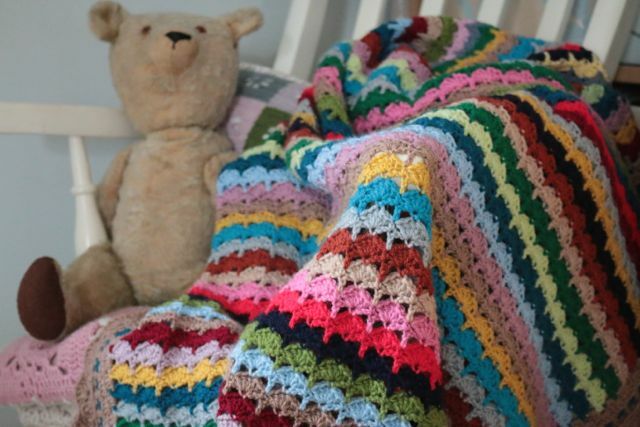 I talked about this little blanket in the making on my podcast, episode 8 and I think in number 9 too. 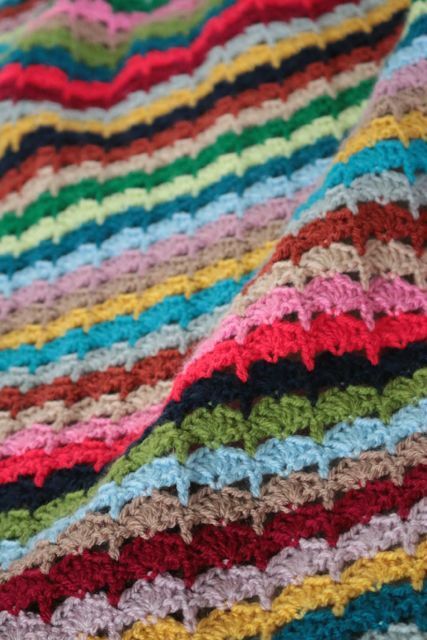 So you might already know that this was my #SOLInspired blanket, a sort of Spice of Life 'spin-off' type thing using my favourite stitch section from the original Spice of Life pattern. 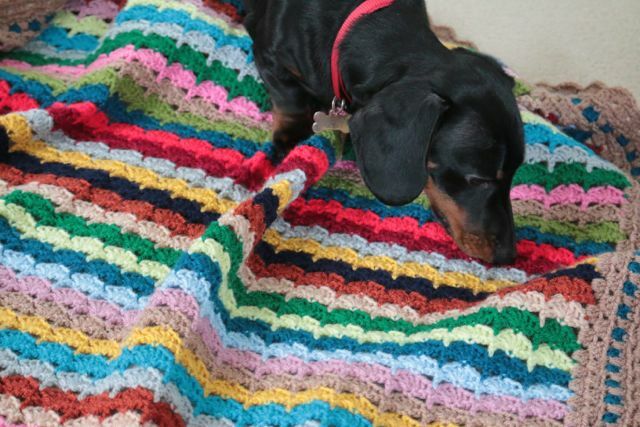 So apart from going for the 'most links in a paragraph' award, this post is to show that I have now finished the blanket. Woo hoo. I'm quite pleased with myself actually, getting this one signed off, as it's been all go here lately. We're embarking on a trip to the dreaded 'house market' and it's quite a time consuming business preparing for inspection. Anyway, I've been plugging away at it quite happily, adding a few more rows here and there without really thinking too much about it when all of a sudden it seemed like it was getting about long enough and I ought to think about stopping. Quite a pleasant realisation. 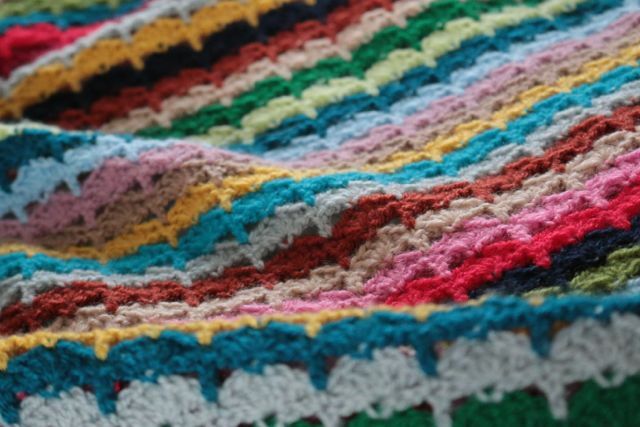 Much of my blanket making time is often occupied with thoughts of what the border should look like. 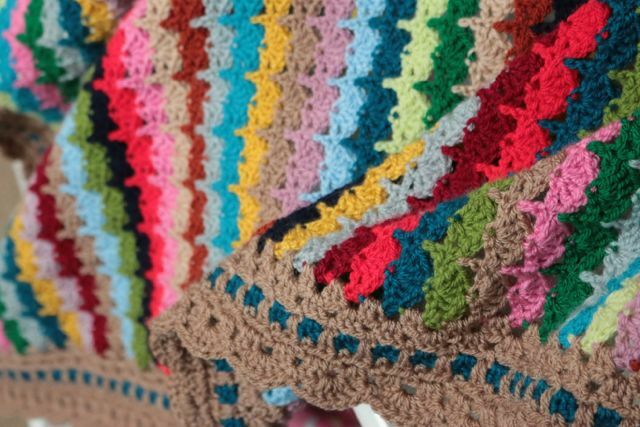 As is often the case, I had notions of a bright affair with many colours and as is also often the case, when it came to the crunch time, I just couldn't get that busy, colourful border idea going. A little frustrating but I did strumble across another idea while I was playing around and I liked how it was looking so I went with it. It looks a little like there's a teal ribbon woven through the brown edging of the border and I really like that. I'm slightly less convinced about the colours I've chosen though. 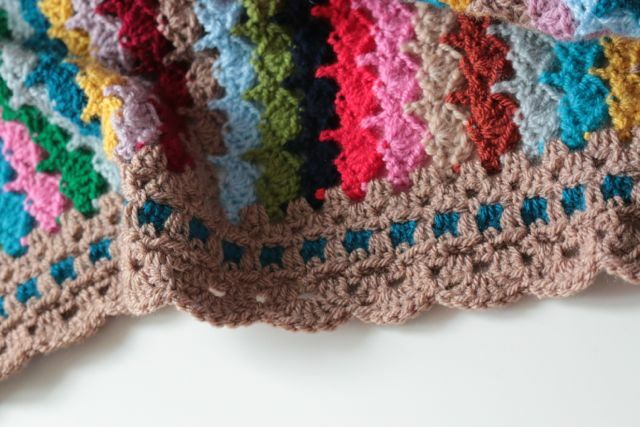 At some point, quite early in the blanket, I decided that the brown would be the dominate border colour and then it never occurred to me to reassess that decision.... Oh well, a little late to agonise over it now I feel! Regular readers will know that it's my usual practise to list a few details about my blankety makes. Yarn types and colours, what pattern I used, the size and so on. 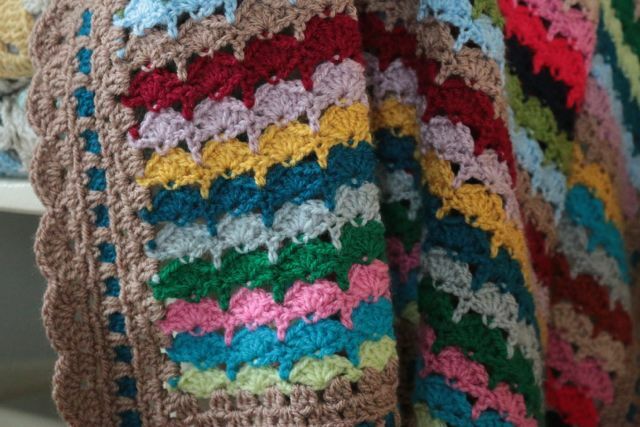 I will be giving a bit more information at the bottom of the post, but I do hope you won't be too disappointed to hear that due to the scrappy nature of this project, I'm really not 100% certain of all the yarn brands and colours I used. There's a real hotchpotch in there I'm afraid, and some I fear are probably discontinued, but I can tell you that it's all DK weight yarn in acrylic or acrylic blends. If there is a particular colour that's just calling to you that you really would like to know about, please do feel free to ask me though. I can still remember quite a lot of them. 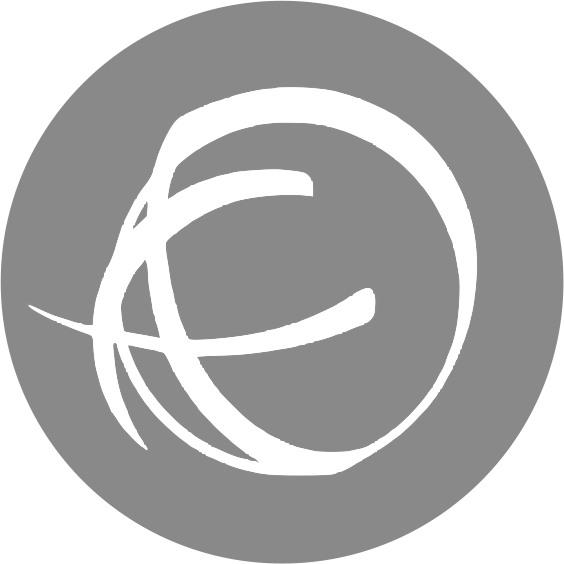 I think it's fair to say that this looks very much like what it is, a scrap project. The colours are not exactly what I would have chosen if I wasn't aiming to put leftover yarn to use but overall I like it. It's got a certain ugliness about some of the colour combinations, but I think it falls more on the 'ugly pretty' side than 'ugly ugly', if you see what I mean. 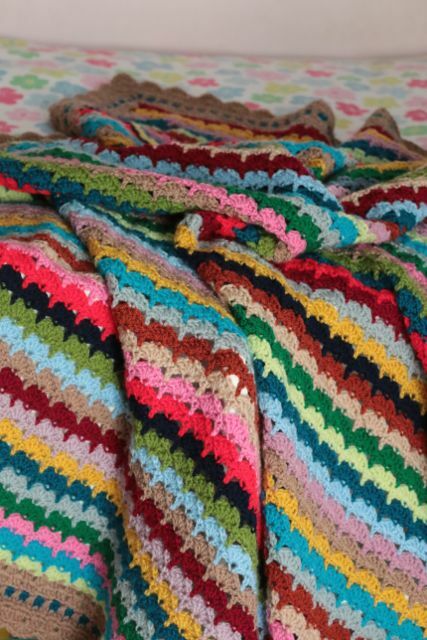 It reminds me slightly of my Colour Explosion blanket in many ways. 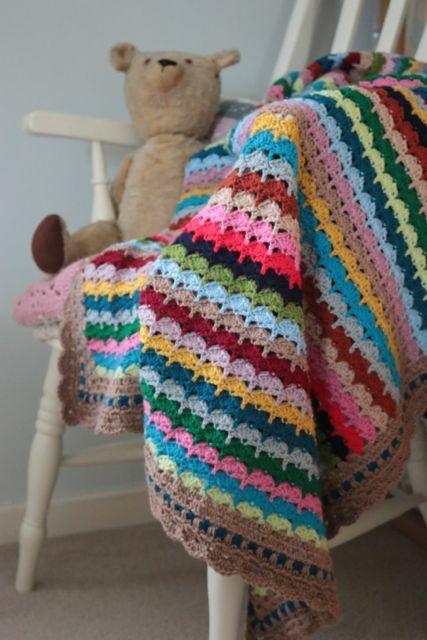 Indeed some of the colours I don't think have seen the light of day since that blanket was made... Neon red, I'm looking at you! I think this will end up being a blanket for my daughter to use in her room. In all honesty I'm not sure quite where else it would look at home and I'm sure it can answer the dual demands of 'night time comfort' and 'spy den door' with the best of them.